You don’t say goodbye, it turns out – at least, I’m not. I refuse to relinquish my connection to Gram, my Little Woman who is also the sweetest and most nonjudgmental being I know. I know she’s out there somewhere, in another dimension, on the spiritual plane, in Heaven – however you want to look at it. I talk out loud to her daily because I want to acknowledge to her that I believe she’s out there somewhere and to let her know that I’m still thinking about her, that I will not forget her. That I won’t live the rest of my life without her in it in some way, because no. That’s not an option for me. I’ve learned from this journeying through my first major loss that I am apparently one of those people who grieves the mortal death of a beloved one by becoming somewhat obsessed with that beloved one and everything said person loved and did. There could not be enough pictures of Gram in my house right now. I’ve put a picture of her in my locket, the antique bronze one that has “Be Right Here” stamped inside (an apt reminder for me now more than ever). I watched her soap, Days of our Lives, the day after she died. I hadn’t seen it in at least three years, since she’d stopped watching it shortly after developing dementia, but I was surprised to realize that I didn’t recognize anyone on there. I remember the days when I could visit Gram when she was watching it and absorb the plotlines of the soap practically by osmosis and then return 10 days later and still be able to follow what was happening to everybody, because stuff moves so.damn.slowly on soap operas. I miss those days. I miss her in those days. For obvi reasons, I became engrossed with Gram’s recipes after she passed, too: because I love to cook, and because – you got it – I love anything she ever had anything to do with. Going through her trove of recipes was an emotional journey – exciting, wonderful, heartbreaking. That handwriting – such steady, beautiful cursive! Such a visceral symbol of Gram when she was vital, well. It brought me back; it moved me to tears. 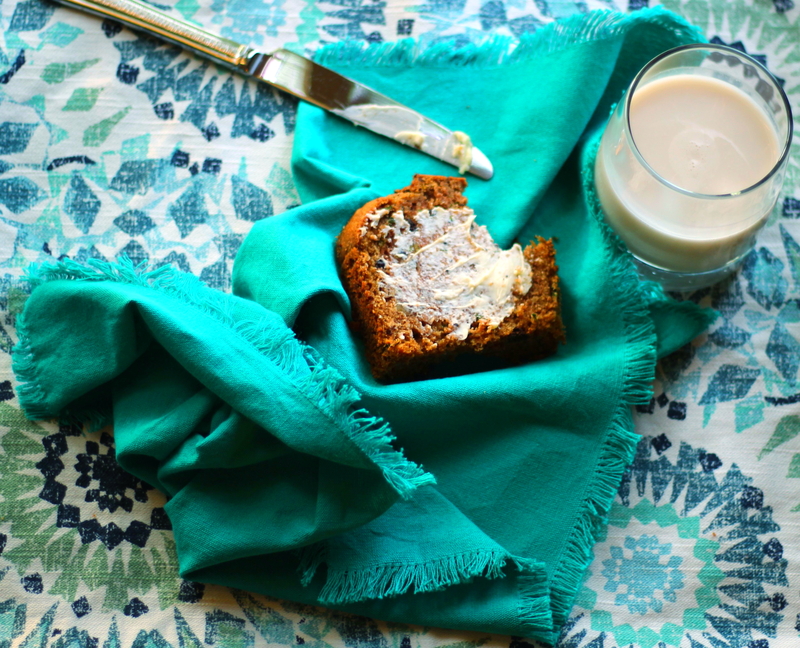 I knew I wanted my first post on this blog after Gram’s death to be one of her recipes – and from the beginning, her chocolate zucchini bread seemed the no-brainer choice. For one, this is the time of year when zucchini is in abundant supply – with many people with gardens or those blessed to know people with gardens looking for any excuse to chop/dice/shred those prolific veggies into any dish that seems remotely fitting. Why not make the excuse to consume zucchini be utterly delicious, in the form of chocolatey, walnut-studded, cinnamon-kissed loaves of goodness endorsed by the very best grandma in the world? Gram’s Chocolate Zucchini Bread Recipe is amazing as-is, but it would be remiss of me not to mention that I’m suggesting two small tweaks in the recipe below. Whereas Gram called for two two-ounce bars of unsweetened chocolate, I am instead advocating the use of an unsweetened raw cacao-plus-butter substitute – mostly because I’m obsessed with unsweetened raw cacao and the fact that something so delicious and chocolatey is also loaded with beneficial antioxidants, vitamins, and minerals. When I saw that unsweetened chocolate was called for in the recipe, I wondered, could I substitute cacao for that? Researching online, I came across this recipe on how to create an unsweetened-baking chocolate substitute on Food.com. Yes! You melt your butter, you mix in your cacao, and you are done. I will say that I did find that mixing the cacao-butter combo in with the rest of the ingredients properly did require thorough mixing, to make sure it blended into the batter properly. I succeeded at this during Attempt 1 and Attempt 2 of making the bread. During Attempt 3 – the one I photographed for this post – I didn’t end up blending it in so well, which I realized after finding bits of chocolate studded throughout the bread as a result – not unpleasant, but also not ideal. 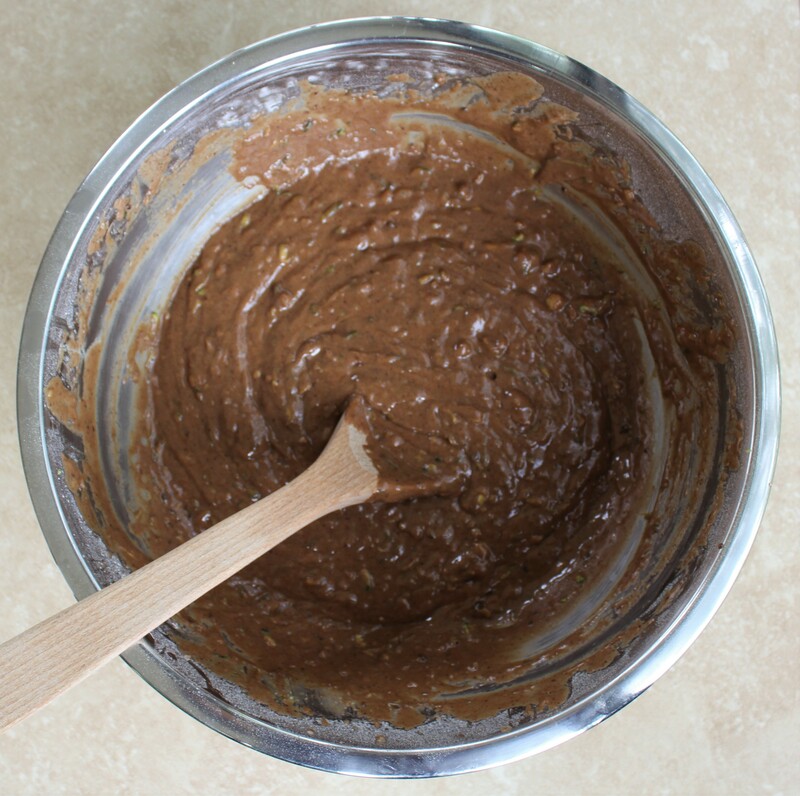 Whether you are using the melted unsweetened chocolate or the cacao-butter substitute, I would recommend mixing it immediately after it’s ready with the other ingredients and to keep mixing until it looks like it has been wholly integrated. The results will be worth it! My second suggested tweak to the recipe? Well, Gram’s recipe suggests pouring the bread batter into three small loaf pans to make three mini loaves. You can still do that, using mini loaf pans (those small ones that make loaves about as small as your hand – what people think of as “gift” loaves). But if you’re like me, you don’t own any of those baby-size loaf pans. However, you may have a couple of eight-by-four-inch-ish loaf pans (as shown in the photo above), so you can pour the batter into two of those. OR you can pour all of the batter into one standard 9×5-inch loaf pan (you got one of those, right? ), and the loaf will be gargantuan – but amazingly gargantuan. I have to say, after making the recipe twice in that manner – as one BIG loaf – I like that way the best. I talk in the recipe about what temperature I recommend baking with each at and how to ensure the loaves are done. It’s not an exact-method – more a trial-and-error method depending on how quickly your oven cooks (mine’s a slowpoke), but it will do. Ok, on to the recipe! I love you, Gram! Chocolatey, cinnamon-y, walnut-studded goodness! The zucchini flavor is well-masked in this recipe, so it should garner approval from even the staunchest critics of that veggie. Plus, this chocolate zucchini bread recipe comes endorsed by the best grandma in the world - that counts for something, right? 1 cup walnuts, coarsely chopped (You can crush them roughly in your hands or wrap them in a towel and break them up with a rolling pin). 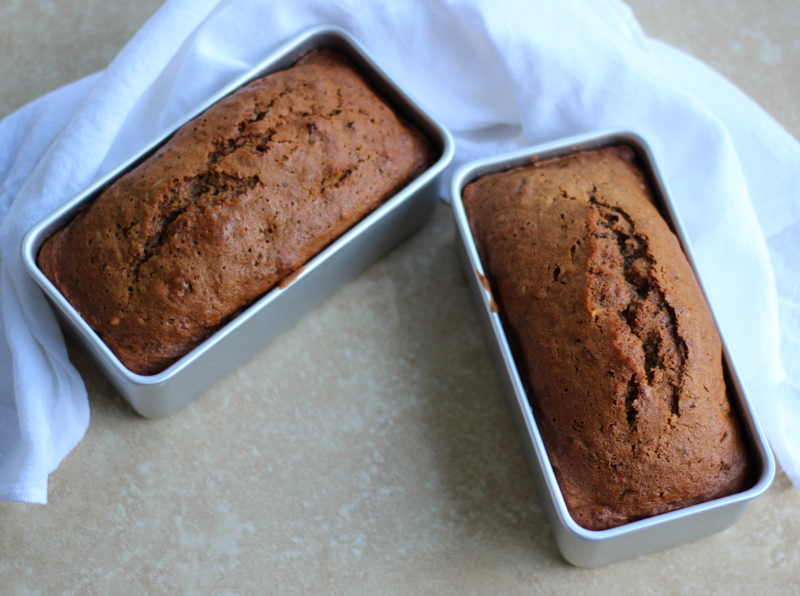 If using one 9x5-inch loaf pan or two 8x4-inch loaf pans, preheat oven to 375 degrees. If using three mini loaves pans that are smaller than these dimensions, preheat oven to 350 degrees. Beat eggs until fluffy. Then add sugar and oil. In a separate large mixing bowl, mix the dry ingredients: the flour, baking soda, cinnamon, salt, and baking powder. Melt the butter and mix it with the unsweetened raw cacao. 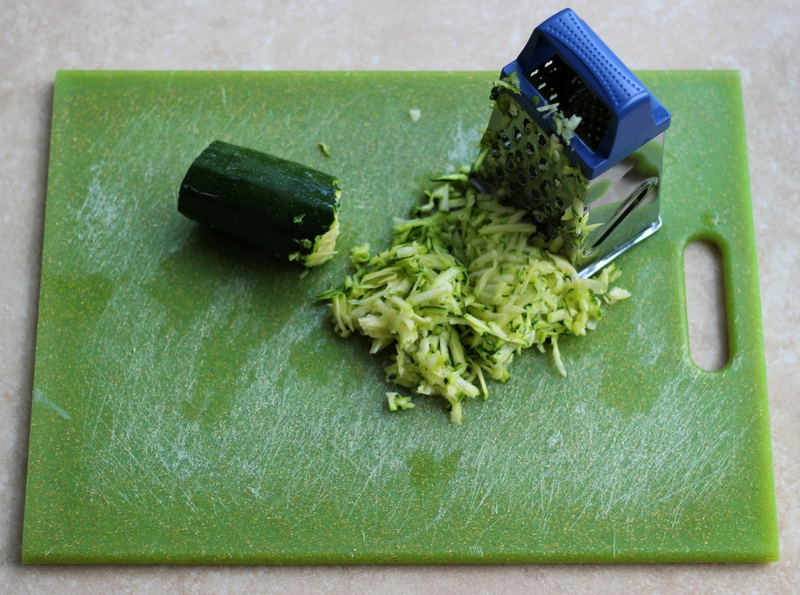 Combine with the egg mixture, grated zucchini, and vanilla until well-integrated. Combine this resulting mixture with the dry ingredients. Then add walnuts and mix well. Grease loaf pan(s) you are using and pour batter in. Bake until a toothpick comes out clean when inserted into the center of a loaf. Regardless of what size/how many loaf pans you are using, start with a base baking time of 50 minutes, and if not done at that time, check in the same fashion every additional 10 minutes until done.